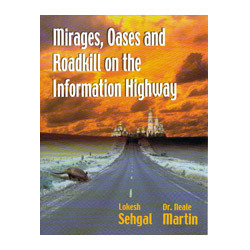 Mirages, Oases, and Roadkill on the Information Highway seeks to provide a larger framework to understand not only the transformation of the information industry, but also how this industry is at the epicenter of bringing about what many refer to as the Information Revolution. To do this, we assess the state of the communications marketplace by looking at its past, present, and future. For different sectors such as local, long distance, wireless, cableTV, and Internet and data services, we examine internal as well as external pressures, the role of disruptive technologies, regulatory machinations, global trends, customer needs, and competitive maneuvers. Those who read this book will gain a rare perspective on the complexity of issues that surround the communications industry. The authors also share their observations, insights, and lessons on various business dynamics and how they can be leveraged for future success. Readers will develop an appreciation for how exciting the communications industry is today and will be for the foreseeable future. And finally, for those willing to follow along on this journey there will be the satisfaction of understanding what is happening in what is arguably the most important business sector in the world — not only for ourselves, but also our global society.